The ship is the sixth to carry the name Esmeralda. The first was the frigate Esmeralda captured from the Spanish at Callao, Peru, by Admiral Lord Thomas Alexander Cochrane of the Chilean Navy, in a bold incursion on the night of 5 November 1820. The second was the corvette Esmeralda of the Chilean Navy which, set against superior forces, fought until sunk with colors flying on 21 May 1879 at the Battle of Iquique. These events mark important milestones for the Chilean Navy and the ship’s name is said to evoke its values of courage and sacrifice. Construction began in Cadiz, Spain, in 1946. She was intended to become Spain’s national training ship. During her construction in 1947 the yard in which she was being built suffered catastrophic explosions, which damaged the ship and placed the yard on the brink of bankruptcy. Work on the ship was temporarily halted. In 1950 Chile and Spain entered into negotiations in which Spain offered to repay debts incurred to Chile as a result of the Spanish Civil War in the form of manufactured products, including the not yet completed Esmeralda. 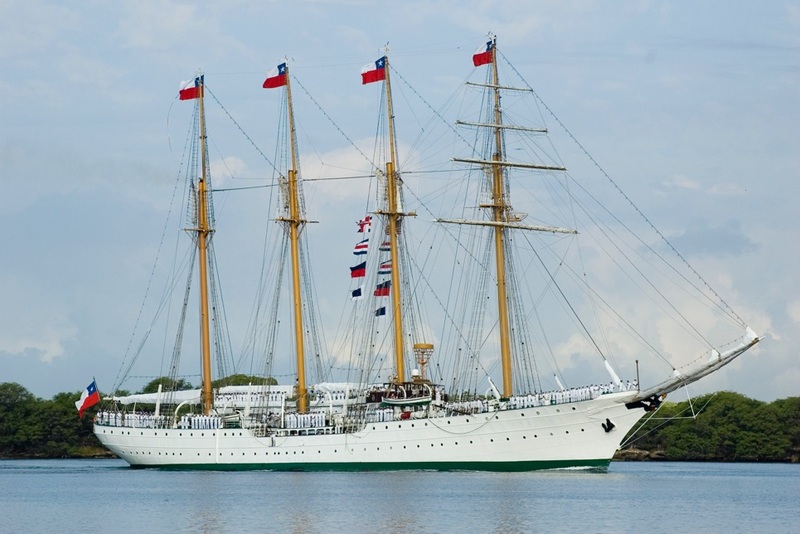 Chile accepted the offer and the ship was formally transferred to the ownership of Chile in 1951. Work then continued on the ship. She was finally launched on May 12th 1953 before an audience of 5,000 people. She was christened by Mrs. Raquel Vicuea de Orrego using a bottle wrapped in the national colors of Spain and Chile. She was delivered as a four-masted topsail schooner to the Government of Chile on June 15th 1954.